There’s an apartment building just across the alley from mine. It’s a real…”fixer upper” to say the least. It’s been a great birdbath for me to watch over the years as the roof puddles like crazy making a nice area for everything from Cedar Waxwings to Cooper’s Hawks to use as a birdbath. In the last few months, Downy Woodpeckers and squirrels have added some holes to the cedar siding of the building. When people ask me what the best thing they can do to avoid birds pecking holes in cedar siding, my answer is, “Get aluminum siding.” Effective? Yes! But I realize this is not in everyone’s budget. Birds like European Starlings will be all over that like ugly on a pig. The owner of this apartment building let things for at least three months and after birds started inspecting the hole, he half heartedly tried to fill it up. Clearly, the patch job didn’t work. This European Starling was actually in the process of clearing out an active House Sparrow nest in this photo. Here the male House Sparrow attacks the invading starling. I really wasn’t sure who to root for in this photo. Both are non-native species in Minnesota and drive out native flickers, bluebirds and other cavity nesters to take over to raise their own young. The sparrows will go as far to kill the original makers of the cavity. 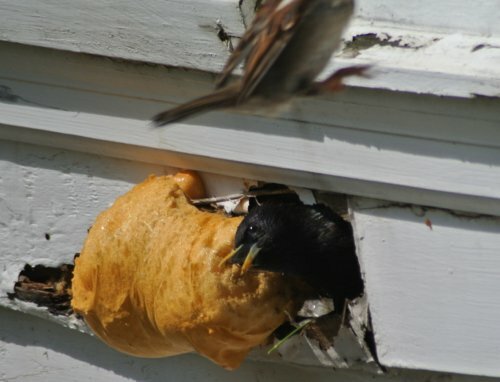 The House Sparrow tried to enter the cavity where its smaller size would give it the advantage and a chance to peck a hole in the back of the starling’s head. But the European Starling seemed to know not to let the sparrow in and used its body to block the sparrow’s entry. When the sparrow would get tired, the starling would resume its mission of clearing out excessive mesting material, including naked, recently hatched chicks. Ew. 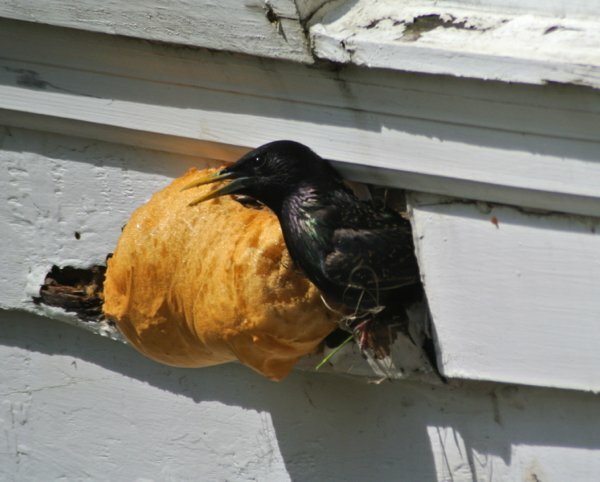 So, what can you do when birds are making holes in siding? Patch them up–IMMEDIATELY with metal. Cover the entire hole. House Sparrows can fit through at least an inch and a quarter. Try using motion sensitive noise makers like the scare spider around the area where the holes have been made. Birds are tenacious and you cannot stand outside 24 hours, 7 days a week to scare them away. But a motion operated device that drops a big hairy spider every time a bird approaches can be very effective. And in the end, look for a home made of brick or aluminum siding. That is really the best way to go. 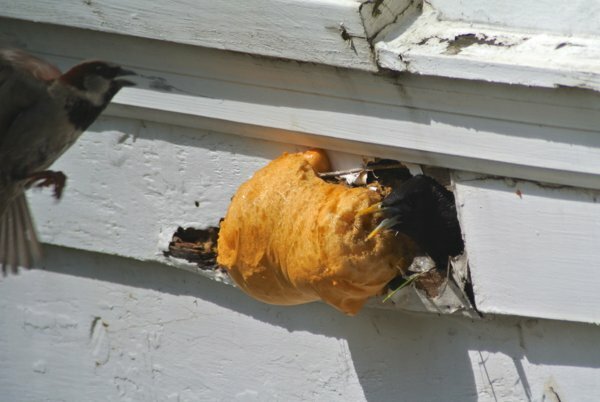 How do I make birds that are living behind my siding leave without hurting them?